When Gilbert Melendez was growing up in Santa Ana, California he spent many weekends at family barbecues and celebrations as he was quietly being groomed for his future in the UFC. Of course, Melendez didn’t know that at the time and it wasn’t as if his family was pushing him into combat sports, but as a 10-year old kid he learned the art of the jab, the hook, the uppercut and every other boxing move while following legendary Mexican fighter Julio Cesar Chavez during his career. Watching Chavez was like a holiday for the Melendez clan as the entire family gathered around the television to see his fights and study the fighter most recognized as the greatest Mexican boxer of all time. "It’s a thing growing up, watching boxing your whole life and seeing the support of the Mexican people — they all come out for the fights," Melendez told FOX Sports. "A lot of support for (Julio Cesar) Chavez fighting, and some other great fights like Oscar De La Hoya, so fighting is part of the culture there." Melendez looked at Chavez as a role model for his fellow Mexicans, but he also started to understand the sweet science behind what he was doing while racking up championship after championship in the late 1980’s and early 1990’s. Instead of just cheering along with the rest of his family, Melendez started quizzing his father about Chavez’s movement, defense and punches and even at that young of an age it started to quietly build the fighter who would one day be considered one of the best in the world. "I think the influence is big. I didn’t know at the time, but the influence is big," Melendez said. "I’d go with my dad to these events or these house parties, a bunch of guys outdoors barbecuing, drinking some beers and ordering the fights. Everyone was getting together to watch the fights, to watch the living legend Julio Cesar Chavez fight. "I was one of a few kids that would have my full attention on the fights. I’d ask questions and my dad would explain everything to me. He’d tell me about the importance of the jab and everything about boxing. Subconsciously I was just studying and falling in love with one on one combat. It had a big influence on me." Years later as Melendez is one of the top lightweights in the UFC about to compete for the title later this year, the support he’s felt from the Mexican community has been huge, especially those closest to him. Just like the entire Melendez family got together to watch Chavez compete, they do the same thing for their champion. He’s also come to count on family to help him with all the different aspects of his fighting life and it’s kept him close to his roots from the time he was a kid all the way until now as he’s become a father himself. "As for family, it’s part of the culture to always be together like a big family. Everyone’s together and everyone has their two cents and they want to be involved. In my life, my wife’s involved, my dad’s involved, a lot of my family members, cousins, are always there supporting me. It can be a lot at times, but I wouldn’t change it for anything in the world. It’s who we are. It’s what we represent," Melendez said. "Now when my family gets together and they throw a barbecue and get everyone together to watch the fights to support me." 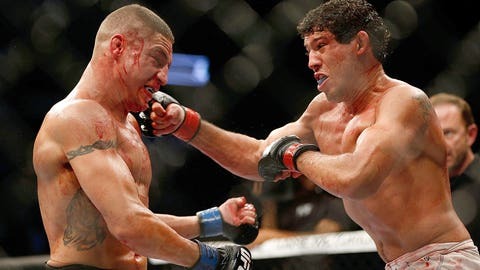 While Melendez ended up as a mixed martial artist instead of a boxer like Chavez, he still carries the Mexican spirit with him into the Octagon every time he fights. He’s quite certain anyone that has followed the best Mexican fighters in the history of the sport will definitely recognize how it has influenced his style. "I always say I don’t speak Spanish very well, but I fight like a Mexican," Melendez said. "It allows me to connect to my people and my roots so it’s great to be a part of that."